Category Archives for "Android Apps"
We are happy to announce the release today on Android the free Screen Grabber app, a flexible screen-capture app that allows users to share screen shots of anything on the screen with just a couple of clicks. The screen shots are automatically sent to a new picture file called Screen Grabs, ready to be emailed, tweeted and posted to Facebook easily and quickly. Screen Grabber reduces file size for quick sending, and allows users to opt for high-resolution screen shots. The Jared Company’s Screen Grabber for Android operates free of watermarks, advertising and upgrade reminders. JaredCo founder and CEO Steven Kader said that the app was designed with productivity in mind, as sharing the screen shots is much easier than with other screen capture apps. Not only that, the app syncs seamlessly—download and it’s ready to go. Screen Grabber also is available for Blackberry and iOS devices. Download The Jared Company’s Screen Grabber for Android at https://play.google.com/store/apps/details?id=com.jaredco.screengrabber. It is currently available for Samsung S3 and Galaxy Tab 2 with OS 4.0. We have just released what may be the most useful free app for the forgetful Android user—Last Ditch Beacon sends an email with the last-known location of the Android smartphone, even if the power is down to 10 percent. According to JaredCo, around one-third of lost or misplaced smartphones have dead batteries. Until now, there was no way to communicate with the device. 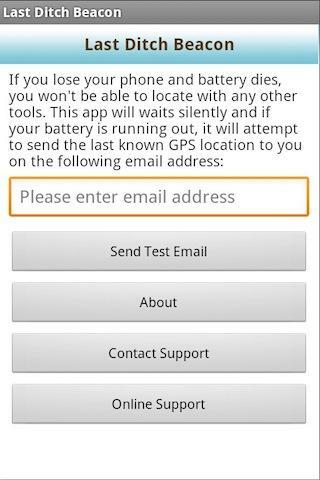 Using the Android phone’s GPS, Last Ditch Beacon sends an email with the last known location of the device when the phone is down to 10 percent of the battery left—complete with a Google map link showing the exact location. No syncing is required. Last Ditch Beacon configures itself with the GPS app. Last Ditch Beacon works on all Android models. Even though Last Ditch Beacon is FREE, JaredCo provides total support. Last Ditch Beacon is now available on Google Play, along with many other useful JaredCo apps like UnfollowID for Twitter and One Touch Flashlight.